I’m back for melted wax fun! 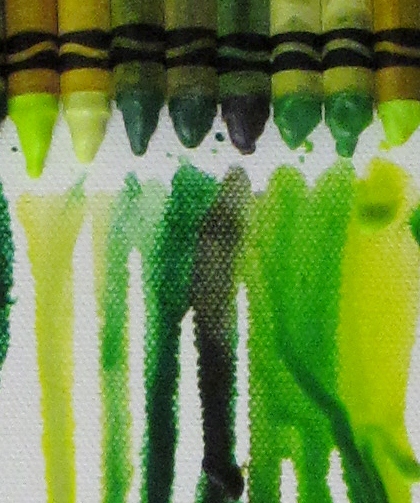 (If you missed it, here’s my first melted crayon art.) For this piece, I turned things upside down a bit. I basically made it the same way that I made the first one (see instructions here.) However, I used a smaller canvas size of 16 x 20 simply because I couldn’t scrounge up more green crayons than that. I found the flowers at Hobby Lobby in the scrapbook section. I arranged them on the canvas to get a general idea of what the final product would look like. Then I went to work gluing the crayons and melting them with a hair dryer. 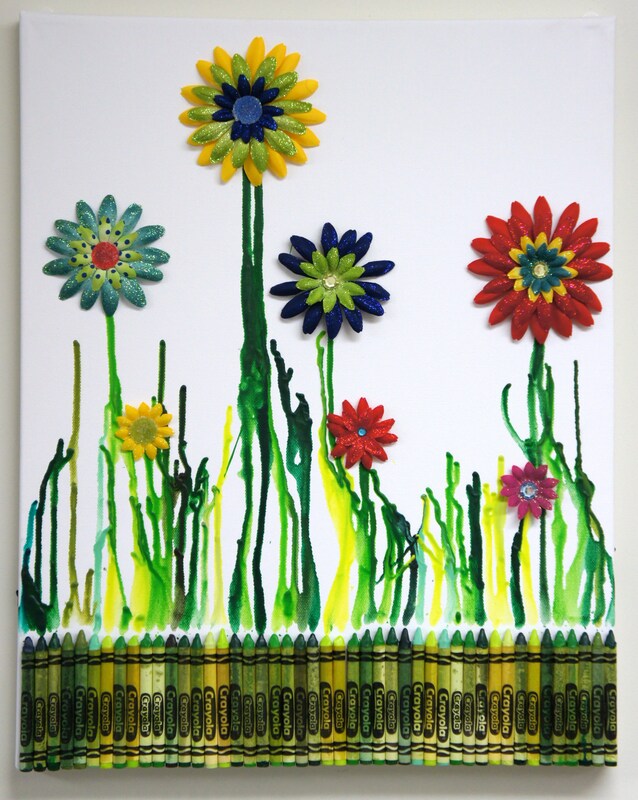 Once all of the melting was finished, I flipped the canvas upside down allowing the crayons to become the “grass” and the melted drips the “stems.” Then I used the glue gun to glue on the flowers. Ta-da! I love these! You have totally inspired me. I’m going to try this in the summer for a school age art program! Fantastic!! I did one very similar to this one with my teen patrons before the holidays! They had a blast! Awesome Katie! What did you use as your base? …canvas…paper…? Did you blog about it? I’d love to see pictures! I just love you ideas, but this one is awesome! I can’t wait to try it! I have to incorporate it into one of my school aged programs!